Our mission and purposes is to improve, and develop the impact of families and businesses by promoting, health, education, physical fitness, networking and volunteering opportunities, encouraging activities, and acting as a community outreach resource by providing goods and resources. We would first like to thank you for this opportunity in advance, we are very grateful for this. We are open on the holidays and have 2 big events a year on the same days and smaller programs in between which are on Christmas and The Fourth Of July day. Currently, we need 15 volunteers on Friday 10-12-18, Saturday 10-13-18 & Sunday 10-14-18 from 6pm-12am (All 3 days). Also, we need volunteers every Friday, Saturday & Sunday until 10-28-18. 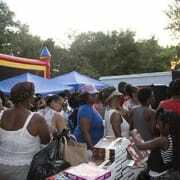 This fundraiser will help us fulfill our mission and purposes currently, we feed families a hot meal at every event for hungry relief on the spot, provide a grocery bag for hungry relief on the go, and a big bag to put other general needy items in them, which are clothes to protect the skin, personal care items and beauty items to promote health, tissue paper, general baby items for growth and development, general household items, school supplies, books, kitchenware, and more where possible. Also, each family will get a resource bag with coupons, free gym passes, discounts off local business service, educational information, networking information, and other general and use information in this bag. This helps fill in the gaps in the city at large, making our areas better and a healthier city, as well as a great place to live. Thank you very much for your support and volunteering in advance and your willingness to help nonprofit organizations, I look forward to hearing from you and have a fabulous and wonderful rest of your day. Would you recommend The Big Super Ten Event?